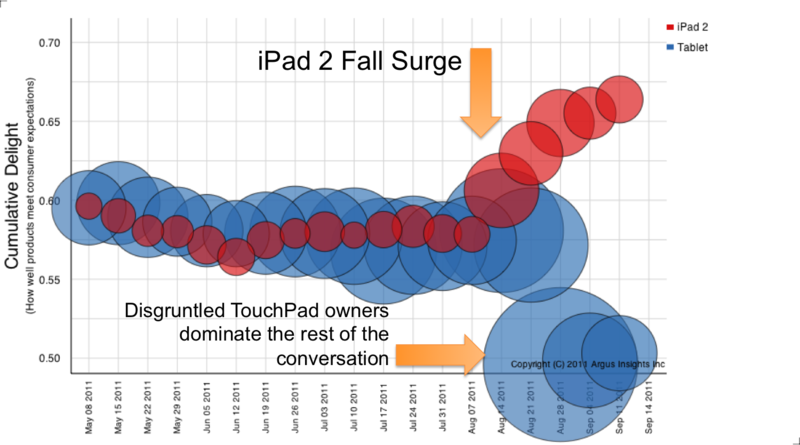 Over a month ago, just two weeks after the Q3 close, we predicted that Apple’s iPad 2 sales would be larger than expected based only on the surge in both buzz and sentiment. Tuesday, after the market close, Apple announced their earnings results. While they missed the mark for iPhone sales, they exceeded expectations for iPad unit sales. The summer surge we saw bore out the prediction that Apple would have a bumper harvest. We are now collecting the early consumer responses on the iPhone 4S, just available last week. Look for an update where we will compare the launch of the iPhone 4S to the iPhone 4 and make an assessment as to whether the 4S is as game changing as Apple hopes it to be. Access to this early consumer feedback can help refine both messaging and inventory planning. Wouldn’t you like to have early knowledge as to how market share is playing out before companies announce? Contact us to see how we can improve the accuracy of your crystal ball. Netflix receives the corporate bronze medal in backpedalling! Siri, how can I filter insights from chatter in social media?